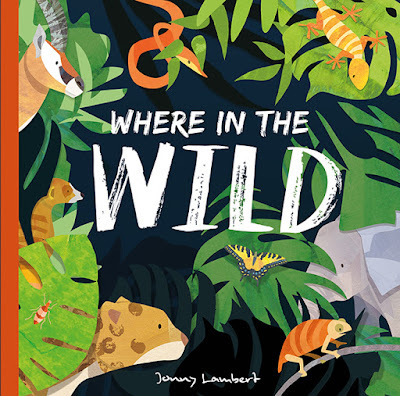 Where in the Wild entwines a fun rhyming text with informative information and a powerful message about the environment. Paired with the most colourful, vibrant and frame-worthy illustrations, it’s a joy to explore with (and without) the kids. From high treetops to shady ground. And insects hide in damp leaf litter. Every turn of the page explores a different habitat and the animals that call it home. The rhyming text highlights a few of the creatures — their features and life styles — and the gorgeous scenes are jam-packed with so many animals to explore and discuss. What I love about this book, and what makes it extra special, is the circle cut-outs on each page that highlight special animals that fit into TWO of the habitats, because when you turn the page to find a new habitat, the animal is still there. I really love this. It’s cool and interesting and kids love it. But it also conveys to kids that animals live in all sorts of habitats, and sometimes animals live in more than one place. Once the exploring of animal homes is complete, the final page is devoted to a message about shrinking habitats and how we all have a role to play in preventing habitats from being destroyed. And what is great about this book is that the call to action is about spreading the word and increasing our knowledge about the environment. This is achievable for kids. It’s something concrete they can do. If you’re looking for a picture book about animals, Where in the Wild is for you. If you’re looking for a book about the environment, Where in the Wild is for you. If you love a good rhyming tale, Where in the Wild is for you. If you love stunning illustrations, Where in the Wild is for you! Don’t you just love a picture book that ticks so many boxes?